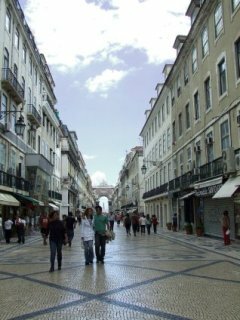 Baixa and the streets around it are all new layout. There are three important public squares: Rossío, Pza. da Figueira and Commerce Square. In the first square you will see the theatre of D. María II and a column with the estatue of the King Pedro IV standing in the middle of the square. In the second square an equestrian statue of D. Juan I stands in the center. These busy streets and squares are always full of tourists. This is the busiest street in this area and leads us to a big door with a neoclassical triumphant arch. Passing this arch we are in the impressive Commerce Square, with its marvellous golden colours. 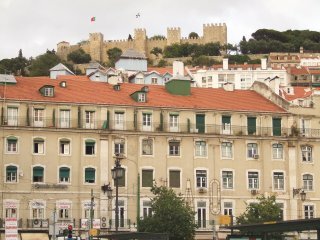 It is especially beautiful to contemplate the way the dusking ligth plays over the buildings and over the Castle of São Jorge. In the Commerce Square was the Royal residence since 16th century. 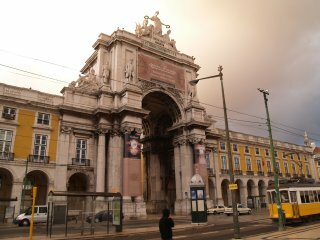 As the square was rebuilt because the 1755 earthquake, following the Marques de Pombal's intrucctions, the new buildings were dedicated to ministries. A lot of trams and buses that depart from the Commerce Square can make your travel more fun and less tiring.